Tony Kelly was football crazy from the age of seven. At sixteen he was the youngest ever player in the first team at Bristol City and in his twenties he became a pro, playing for clubs such Stoke City and Cardiff City in the Football League, second and third divisions. But his blossoming soccer career was marred by a series of mishaps and misdeeds which drove him to disaster. Ruined by an addiction to gambling, he lost his job, his career, his partner and all his money. Now he has written his story – as Kelly puts it, to “invite the public, my family and my friends into my secret hell of racism, despair, depression, stardom, gambling addiction and ultimately self-destruction”. 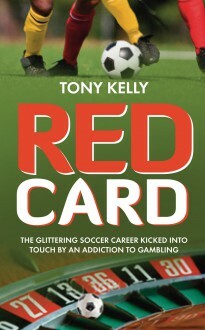 Red Card is a tragic yet uplifting story of a sportsman’s battle with his demons, on and off the pitch.